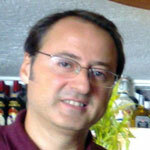 · 22 years experience as professional in the computing field. · Sponsored by School of Visual Effects Gnomon Inc. (Los Angeles, CA. US) for 9 years. · 3D modeller for ViewPoint Datalabs (Orem, Utah. US) for 4 years. Premium and Elite Catalogue. Model Databank. · Represented by agency 24/7 Media along with Microsoft Spain (MSN), and Lycos-Terra for 3 years. · First media for 3D designers in spanish language on Internet (1997). 3DSpanish.org. · First search engine for 3D & multimedia in 11 languages (1998) for 9 years. 3Dup.com at first. · Vertical portal for 3D design, visual effects and multimedia for 4 years. 3Dup.com: 2007-2011. · Head of Development at Audiotube. 5 years. Legendary Chris Blackwell’s initiative (London-Port Banus). Island Records founder. U2 & Bob Marley’s Patron. · Numerous opinion articles in newspapers and magazines. Dual-mind professional with an extensive knowledge about technology, including programming, video encoding, design, hardware, and online business development in technical and concept terms. Fidelity to the original source is absolute so video is not resized to avoid losing details. Download an improved version of this video here — Original material of this montage is here. · Current Codecs: H.264, HEVC/H.265, VP8/VP9. · Adaptive Formats: MPEG-DASH, Apple HLS, Microsoft Smooth Streaming, and Adobe HDS. You can decide by yourself once you watch the video. There are some noteworthy points anyway, above all taking into account that a timelapse composition is always a difficult kind of video to encode. As you can see, it is possible to reach Vimeo’s quality using virtually 50% lower bandwidth, and with an imperceptible effect in gradients at high motion zones —like water or clouds—, and with improved quality in details like ground, stones or trees, and all this within the limits of a difficult to believe 51.11% off using H.264 codec. In the Youtube’s case, the difference is greater than Human Factor’s approach. Feel free to pause video to see the perfectible performance of Youtube requiring more bit-rate (+40%). 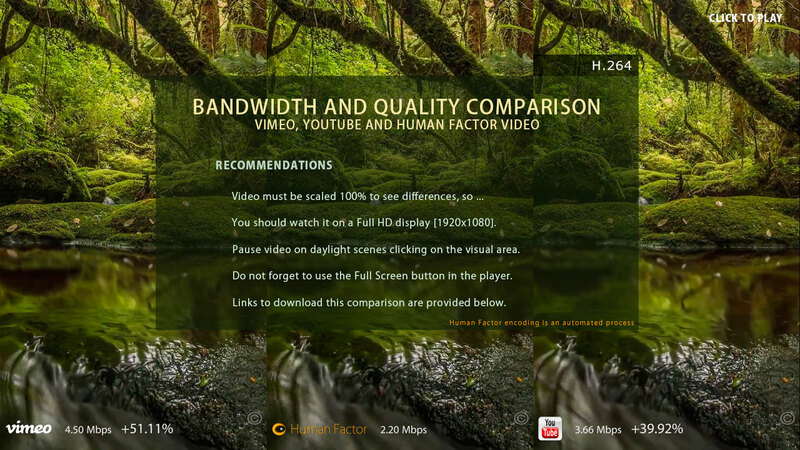 In summary, you can see the results of an innovative set of techniques developed by Human Factor Video, which are able to save much money on bandwidth while keeping and improving image quality. Take your own decisions in accordance with these facts.